I dont know dates of adoption. But two of these flags (Ground F. and Air Defence F.) seen many times at parades and press-coferences in Ministry of Defence. 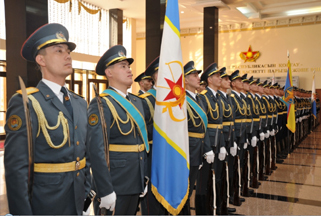 current flag is seen here (measurements are 2 meters long by 1 meter high): http://www.mod.gov.kz/.. . It features a red five-pointed star on the canton, measuring 30 cm from one end to the other, and in the middle, the sun and the golden eagle). 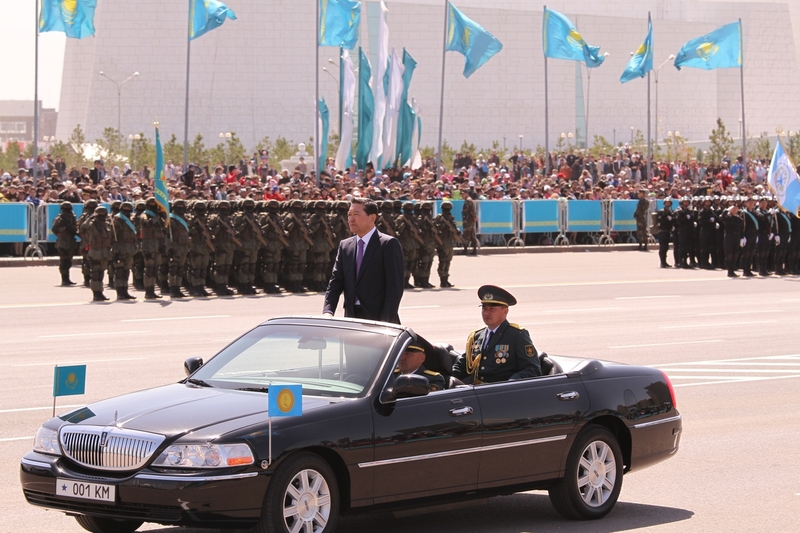 current flag is seen here (measurements are 2 meters long by 1 meter high): http://www.mod.gov.kz/.. .. It features a red five-pointed star on the canton, measuring 30 cm from one end to the other, over a silver anchor and in the middle, the sun and the golden eagle). The top fringe is white and the bottom is sky blue, both measuring the same in width. 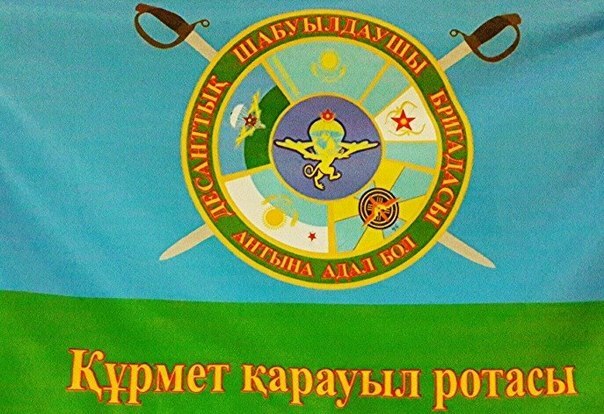 current flag is seen here (measurements are 2 meters long by 1 meter high): http://www.mod.gov.kz/.. .. It features a red five-pointed star on the canton, measuring 30 cm from one end to the other, and in the middle, the sun and the golden eagle). The flag is horizontally divided in equal stripes, the top part having 13 rays, seven white and six sky blue, spreading from the middle in a circular way, from the middle outward and the bottom part being sky blue. 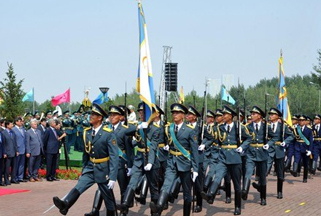 current flag is seen here (measurements are 2 meters long by 1 meter high): http://www.mod.gov.kz/.. .. It features a red five-pointed star on the canton, measuring 30 cm from one end to the other, inside a rectangle that measures 32 cm high and 65 cm long and has 24 rays from the middle outward, 12 white and 12 sky blue. and in the middle, the sun and the golden eagle). 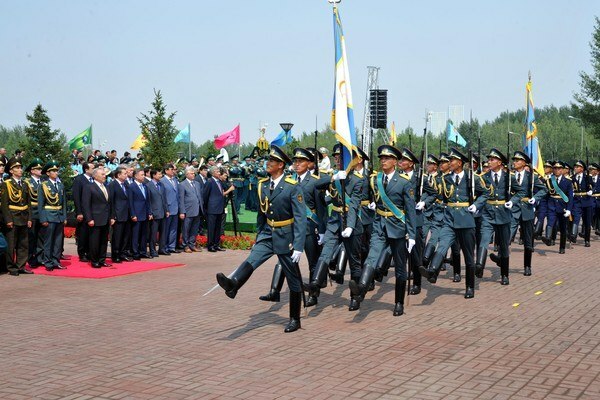 on January 21 I saw the (purported) Kazakhstan Armed Forces here: http://en.tengrinews .kz/... (source: http://en.tengrinews.kz/...). 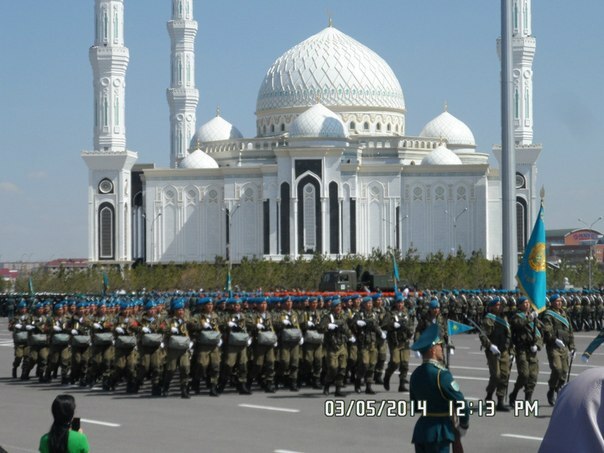 The picture was taken on May 7, 2014 during the Defense of the Fatherland/Fatherland Defender's Day military parade, and published the next day online, on May 8. Picture credits to © Turar Kazangapov. 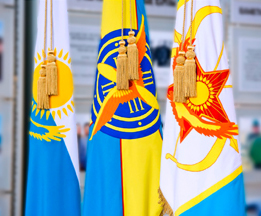 It features >the CoA of the Armed Forces) on a light blue horizontal background. I think it is not flag of MoD. It is ceremonial flag of the Navy. Soldiers at the photo (http://www.mod.g ov.kz/data/nws/rus/img_2323_6931.jpg) are from Honour Guard. 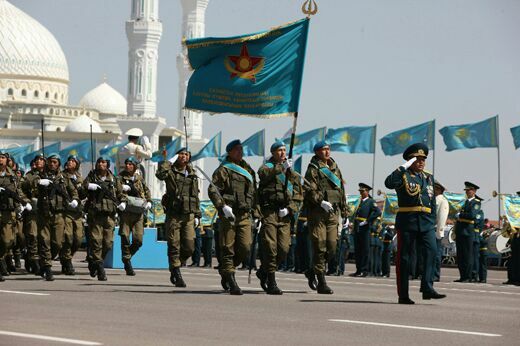 They have flags of main army branches - Land Forces, Air Defence Forces, Navy. 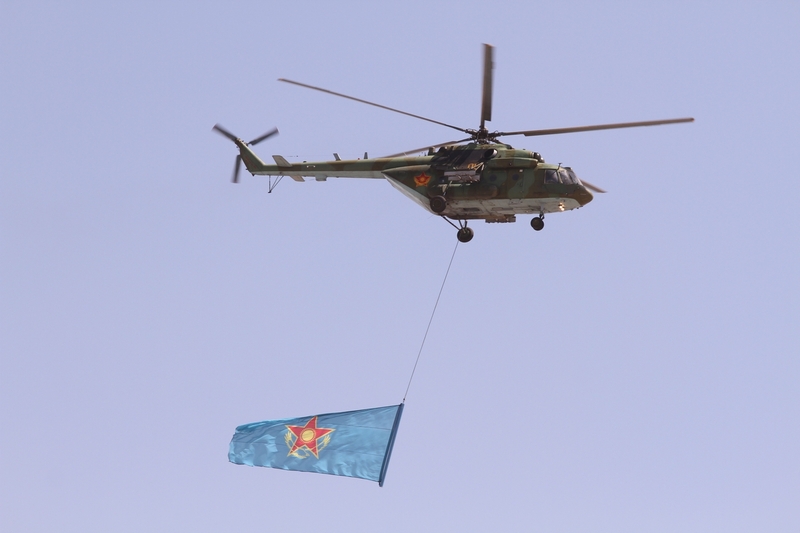 Why you think these flags belonged to 2nd Brigade of Air Defence Forces 3rd Brigades? Roman cyphers at the emblem? For me they means nothing. I think in both cases it is Air Defence Forces flags with minor artistic differences. Regarding the above, I guess you are right. At a first glance, it seems the emblem has many different symbols representing the different branches. But when you take a closer look (and judging from the uniform the troops in the picture are wearing) I agree with you that it is a Naval forces flag (maybe another Honor Guard flag). 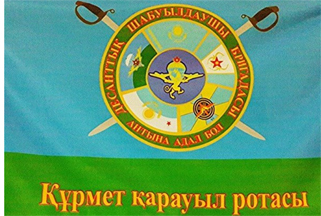 The Naval forces CoA ( http://www.globalsecurity.org/military/world/centralasia/images/kazak-navy.g if ) is indeed featured on that flag, without the outer ring inscription though. This is the official website of the ?скери те?із к?штері (Naval Forces) by the way: http://www.mod.gov.kz/rus/struktura/vooruzhennye_sily_rk/voenno-morskie_sily /index/ Now regarding that last paragraph, I infer they are Unit flags (i.e. 2nd or 3rd Brigade) for the naming system (Order of Battle) thay they inherited from the Soviet era. Remember that their main military (strategic) Units are usually Regiments, so in case it's not a Regiment, it's a Brigade. I don't think the Roman numerals in the flag is a mere coincidence. On the contrary: I do think they are, as I just mentioned, Unit flags, so they each represent a different Unit. Still, I think we need further information and further evidence tu support any of either statement, but for the moment, the least we can do is include this thread and all its discussion on its respective section to update it.